One of the things I expected to see one day in the life of 4e was a pair of robust boxed sets for the Shadowfell and the Feywild. While it doesn’t look like we’re going to get that any time soon, we’ve gotten a couple of things that attempt to bring the two 4e additions to the D&D cosmology to life. For the Shadowfell we got Gloombrought and Beyond, a kinda, sorta boxed set detailing the city of Gloombrought and it’s surroundings. To be fair, it’s probably more than enough to run stories set in the Shadowfell, as it includes tons of tokens and encounters with which to make Shadowfell based adventures from. A player’s book, Heroes of Shadow was also released, allowing players to create heroes touched by the power of the Shadowfell. It looks like one half of the mirror images of the world is covered, and now it’s time to move on to the Feywild. 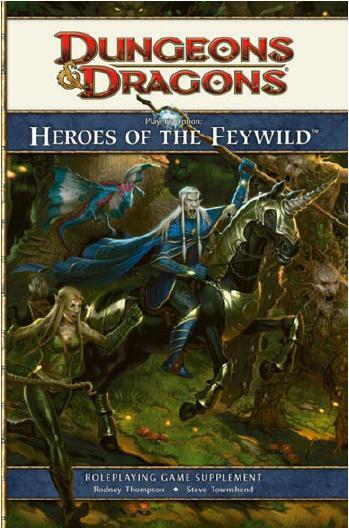 Sadly, we don’t have a Feywild boxed set yet, and a scan of the upcoming release schedule doesn’t show one on its way either, but now we do have Heroes of the Feywild, a 160 page 4e D&D book on player’s options revolving around fey creatures and the like. I figured I’d scan the book and write my thoughts from the point of view of a DM, keeping in mind that PC based books aren’t really my thing, and I won’t get into the mechanical aspects of powers and feats and so on, as you can find better analyses of that elsewhere. At first glance, my thought of the book and the presentation of it is that it’s a very whimsical and fairy-tale like experience. The authors (Rodney Thompson, Claudio Pozas, Steve Townshend) have tried to not only create a 4e sourcebook, but also an entertaining read regardless of whether you’re a player or a DM. There’s something here for you if you’re headed to the Feywild. With plenty of sidebars, story material and flavor, this book provides just enough setting lore that it can at least get a Feywild campaign going. It’s obvious upon reading that story and fluff were a very important part of this book. It’s a trend that WOTC’s books have had of late, and it continue with this latest release. The first chapter of the book greets us with a beautifully rendered hand drawn map of the Feywild by cartographer Mike Schley, whom I am a huge fan of. With names like Kingdom of the Sea Lords, Fortress of Frozen Tears, and The Fading City, the map alone is a nice source of inspiration. There are little touches as well, like sea monsters, “Here There Be Dragons” labels and satyrs marching on the plains. nice stuff from a great artist. This chapter serves as an introduction to the Feywild, describing it as a land of enchantment, a storybook land, and a land of unknowns. It also talks of how the Fey creatures see their world and their place in it. Along with that, we get actual descriptions of locales within the Feywild. Described are places like Shinaelestra, a city overrun by wilderness that fades into the natural world every night at midnight; or The Isle of Dread, a treacherous tropical island shifting between the Feywild and the natural world at different points in the ocean of time. One of the great things about this book, and they begin in the first chapter, are the “Bard’s Tales” sidebars. These sidebars are basically fairy tales, even starting with the “Once Upon a Time…” which provide you with not just stories set in the land of Fey, but also hooks or story ideas for your campaign. While it can’t obviously provide a complete look at the Feywild, the first chapter of the book certainly does enough to give you a good flavor beyond what Manual of the Planes did for the Feywild. you can certainly jump start a campaign set here with the information presented on the Fey, their factions and the locales involved. And here we get into one of the the crunch-heavy parts of the book, the races. The book gives players three new races from which to create a character with: Hamadryad, Pixie, and the Satyr. Hamadryads are described as the incarnate spirits of living oak trees. Part flesh, wood, and fey spirit, these plant based creatures (whom are all female), are beautiful creatures who present themselves in two aspects: nymphs and dryads. Pixies, perhaps the most talked about race in the book, are presented just as you’d imagine. Resembling diminutive Eladrin, pixies don’t bother me nearly as much as I thought they might, and I actually have some interest in running a game with them in it. Pixie dust makes an appearance, of course, granting an ally the ability to fly up to 6 squares as a free action. I really like one of the story elements of the pixie, where they come from. Legends say that whenever a human child is born, a pixie almost comes into existence. Their personalities indistinguishable for as long as that human is a child, until adolescence comes and casts away those childlike ways. While they are immortal, some pixies are so bound to their human reflection, they also perish when that human dies. Satyrs, male creatures resembling humans with the legs of goats are described as mischievous and investigative tricksters. It goes on to describe their communities (small clans), how they live life to the fullest, and what sort of adventuring classes a Satyr would prefer to be. As a DM, of the three races presented, I think I actually like the pixie the most. When I first saw the race, and some of the artwork in it, I had an idea for a Neverland based campaign involving an all fairy party rescuing Peter Pan from… something. It just seems like it would be a fun character to play and create stories for, using its size for interesting locales, and its story of human bonds for an emotional type story. Yeah, I dig the pixie, it gets my seal of approval. This chapter includes more material for races and classes, including the typical sections of themes, feats, paragon paths and epic destinies. Of interest to me as a DM are the sections on mundane gear, magic items, and Fey gifts. The mundane gear, or at least mundane in the Feywild, is neat because it has by its nature a bit of magic attached to it. So for example, Cold Iron Shackles can be used to prevent fey from teleporting, since cold iron is anathema to fey. They are normal, mundane shackles, yet have a bit of extra umph to them. Another example is the Doppleganger Mask, made by gnomish artists. It specifically states that it isn’t magical, but rather so well crafted that it perfectly adopts the features of the creature it means to depict, granting a +5 bonus to Bluff checks to pull the disguise off. Fey gifts fall into the largely (and sadly) unused category introduced in the DMG2, the alternative rewards. They share the same rules as magic items in the game, and work alongside divine boons, legendary boons, and grandmaster training in replacing magical items as rewards for players. The book introduces 13 fey magic gifts, and if I’m correct, it may be the largest published addition since the DMG2 of alternative rewards to the game. Fey magic gifts are said to only be available in the feywild, where they change hands as part of a bargain between a powerful Fey and an adventurer. This could be a quest reward, or an incentive of some sort. These are good story tools to use, while at the same time rewarding your players. A favorite trick mastered by gnomes during their days of enslavement, this gift allows you to actually sniff out gold and other treasures. Thieves from the natural world often seek out fey creatures that can bestow this gift, which allows them to quickly locate valuables at the sites they are robbing. The final chapter in the book is an interesting one, and a new addition to 4e D&D. 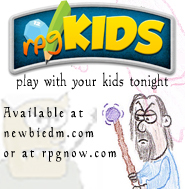 It allows players to determine their characters’ background and upbringing through an almost Choose-Your-Own-Adventure type setup. It seems like an interesting way to build a background for a pc, and I’m curious as to whether or not something like this may pop up again in other books. In the end, you not only finish with a background, you also determine where your ability scores may go based on aptitude tests you take along the way. I have to say I’m intrigued by the chapter, as it seems to be another way of adding more story to the game. So in closing, I like the book, while obviously made for players, there’s enough there for DM’s to draw from in order to create games centered on the Feywild. I really enjoyed the presentation of the sidebars as fairy tales, and was glad to see alternate rewards included as well. The book follows a recent trend of D&D books where it’s obvious that including more story has become the norm, and that’s a welcome sight. Boring player books like the old power books for example, can be bid good riddance if what we have to look forward to are books like these. The crunchy chapters aside, it was a joy to read and the presentation was top notch.